But it is impossible to do so to the stroke of the enclosed path above. Left-clicking on its path/stroke/anchor pint, its fill always appears rather than its stroke. So what can I do to change the opacity of the enclosed stroke ? Thanks. PS: With the strokes that are possible to change their opacity, it seems that I used Live paint Bucket to create Live Paint groups and then colored the areas that these strokes encompass. Then I clicked expand and ungroup these strokes. 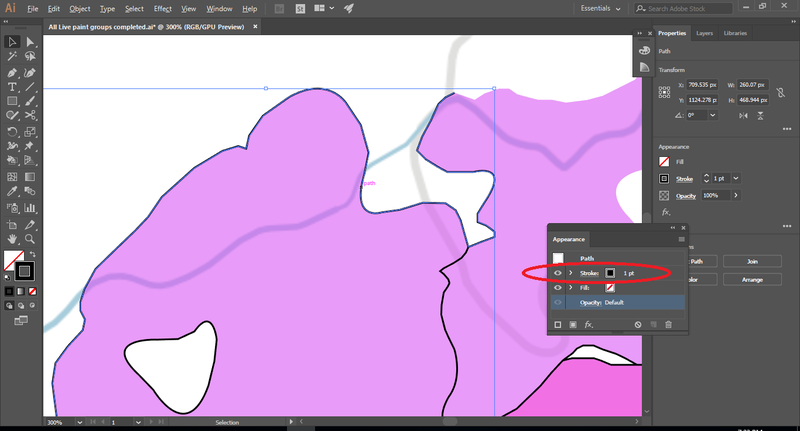 That allows me to distinguish between strokes and fills of these areas. But for the areas that I did not create Live Paint group and expanded and ungrouped, it seems that I can't distinguish between stroke and fill to change their opacity separately. What could I do? Let see, as far as I see what do you want to get is a black stroke with less opacity. This means a gray stroke. Changing the stroke opacity you will get unexpected results when just a part of the stroke leave a part of the fill visible, like showed at the gif below. Why you insist with the opacity instead of changing the stroke ink percentage? 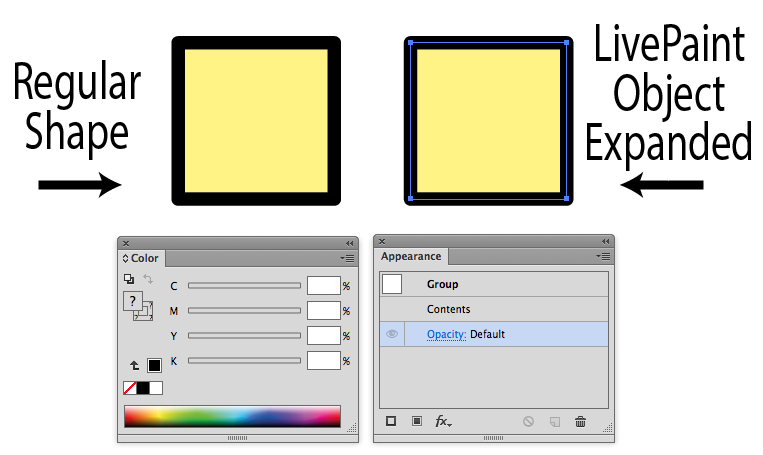 Appearance Panel: allow stroke and fill color changes to Regular Shapes but not to LivePaint Objects. 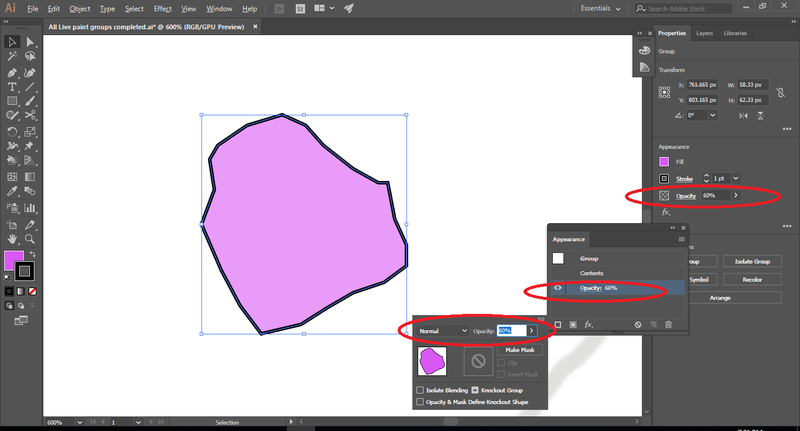 The Expanded Live Paint Object is a group, to allow color changes individually it is necessary to Ungroup the expanded shape. Not the answer you're looking for? Browse other questions tagged adobe-illustrator transparency stroke fill or ask your own question. How do I change the default color library for stroke/fill in Illustrator? 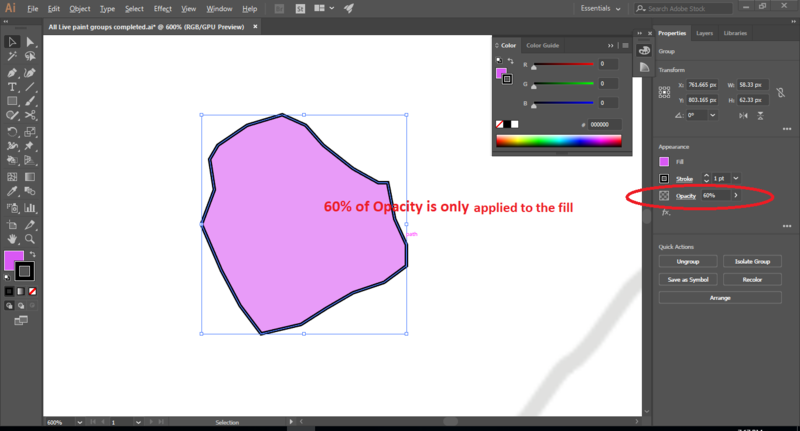 How to overwrite brush “texture” with single color in Illustrator CS6? How to make a fill or stroke change its color when the swatch used for it changes? Why can't I use live paint with the paint brush?